Located near the George Washington National Forest, this cozy, riverfront cabin is a perfect getaway. Enjoy unforgettable memories, relaxing in the hot tub, swinging on the porch, or sitting around the campfire with your feet in the river, listening to the calls of 100 different birds. All pots, pans, utensils, are provided along with coffee maker and toaster. This is a very clean, modern cabin with rustic touches to make you feel at home. We have recently added new top-quality mattresses for your comfort. All linens and towels are provided for maximum sleeping capacity. What an amazing place. We had a very wonderful time staying here with the comfy and cozy canin that hs the great view of tye river. Thanks for sharing this beautiful cabin with us and I hope to revisit it again sooner. 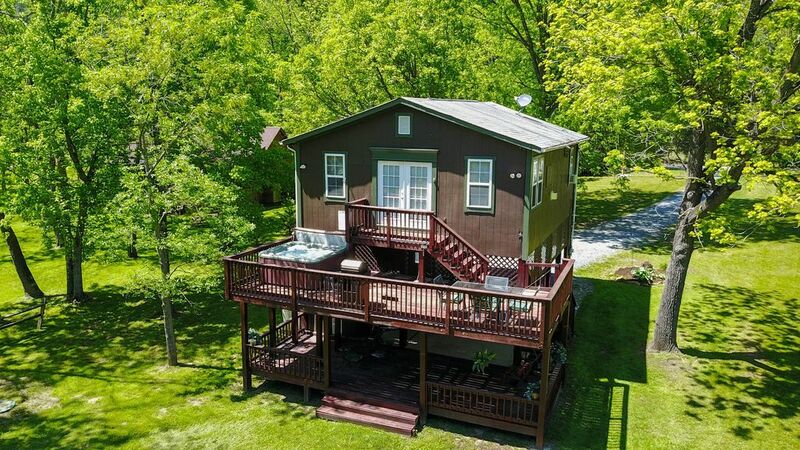 This cabin is a wonderful option for a chance to unplug and unwind in the beautiful Shenandoah Valley. It sits right one the river with a great amount of property so the kids can play and run around. We spent our nights sitting around the fire pit on the river bank and enjoying the hot tub on the deck with amazing views. The cabin is cozy and was the perfect size for my family of 5. There are also canoes and river tubes available to use. I definitely recommend Bear Valley!!! Lovely stay at Bear Valley Cabin! We had a wonderful stay at Bear Valley Cabin! The cabin was quiet and had all the amenities of comfort. We loved the hot tub and woke up to the beautiful scenery of the light snow and river flowing outside. The location was perfect. Close enough to town but seclusive enough to afford our privacy. Our family really enjoyed ourselves with my wife on her birthday weekend!!! Relaxing spot on the water! The cabin was just what we needed - two bedrooms and kitchen/living room area. Everything was clean and in order. Really enjoyed the fire ring right by the river and the stars from the hottub! A great cold weather retreat! The cabin is exactly what the description says it is. The place is clean and has everything you could need. The hot tub is a bit worn but still works and is very relaxing. Great cozy cabin with a wonderful location that can’t be beat. There’s a fire pit by the river which is great in the evenings for catching sunsets. Tvs in every room, comfy beds and couches and a kitchen that is stocked well with appliances and utensils for prepping a full meal. Canoes and life jackets provided on site but did not use them as was not sure how to get them back if river current carried us too far down. Honestly the only critique is the internet which is not “high speed” at all. It is a DSL connection but barely manages to handle the traffic required from modern devices...however honestly if you are retreating to a cabin in the mountains internet should be the last thing you worry about! I would 100% come back here again, excellent stay.